My attention has been with The Raw Dessert Kitchen (the 'baby' of ours) that recently saw the daylight for the first time. 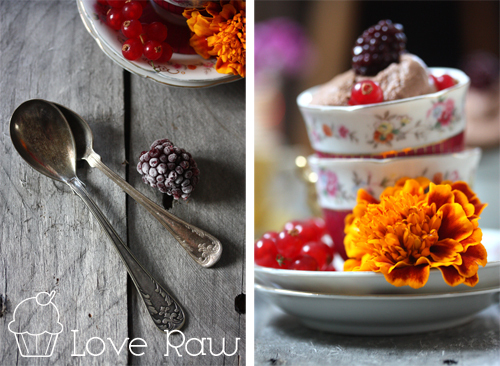 The new site is for the newbies of raw desserts as well as the more experienced. 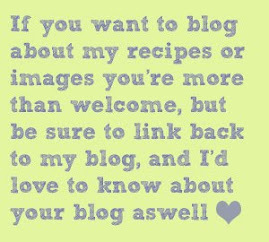 So come on over and have a look! One of the latest dessert, a little something you can enjoy any day, but especially on Valentine's Day, is my Valentine's Day Cookies. They have a melt-in-your-mouth feel that I love. I'm sure you will love them just as much! You'll find the nut free recipe here. 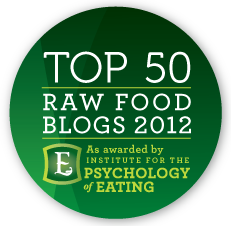 Also, I'd love to get your feedback on the new site! Feel free to come with suggestions and ideas. 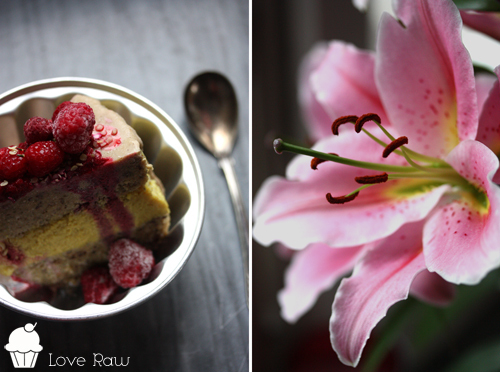 Big Changes for The Raw Dessert Kitchen! Me and Jakob have decided to transform The Raw Dessert Kitchen. A lot of exiting stuff is going to be available for you when we are finished. 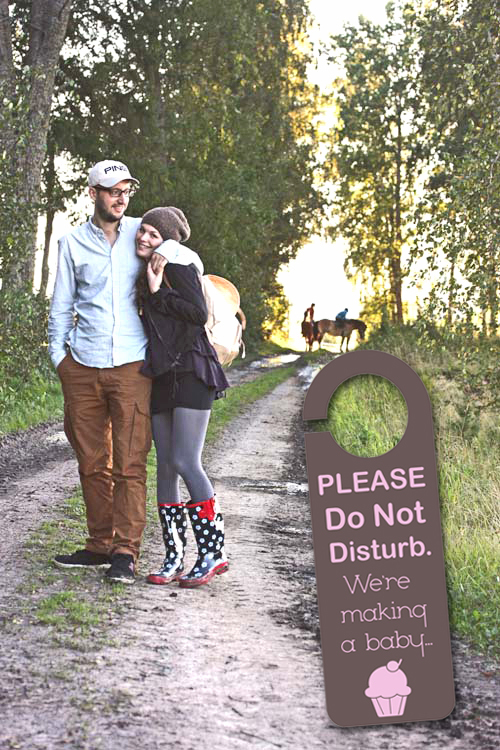 So far we can't give any more details, but I won't blog for a while now. 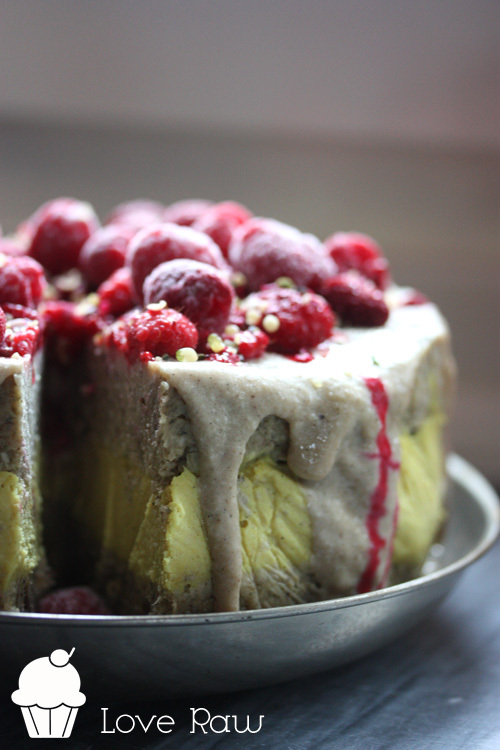 We have a BIIIG raw cake to bake you see and all of my love is going to be poured into that cake. 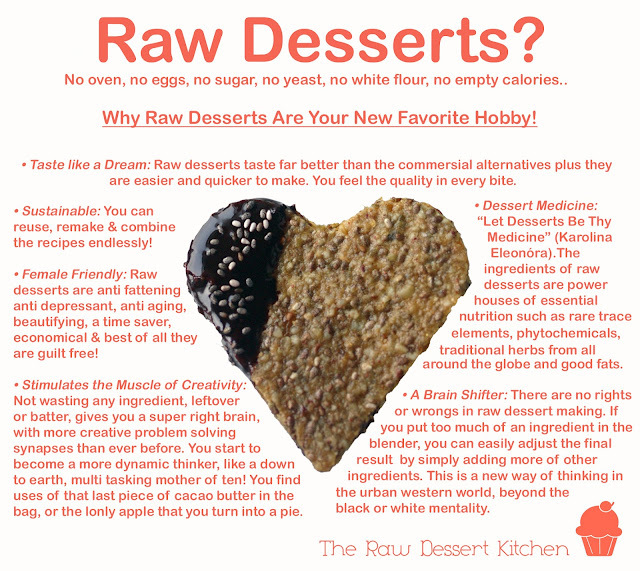 We are crazy in love with the idea of coming together as a business couple, The Raw Dessert Kitchen is no longer going to be my one-man-band. When we open the doors to show our new baby you will get so much more of what I and Jakob can offer you. Oh, and if you would miss me, come on over to my page on facebook where I'll keep you updated on whats going on in our lives. And don't worry, you won't be spammed with 10 posts on your wall every day ;) We like to keep it spam free. Hail to the Ground Crew of the Mothership, shiny beings you! It's intense times, change is in the air. I'll only have time for a quickie. 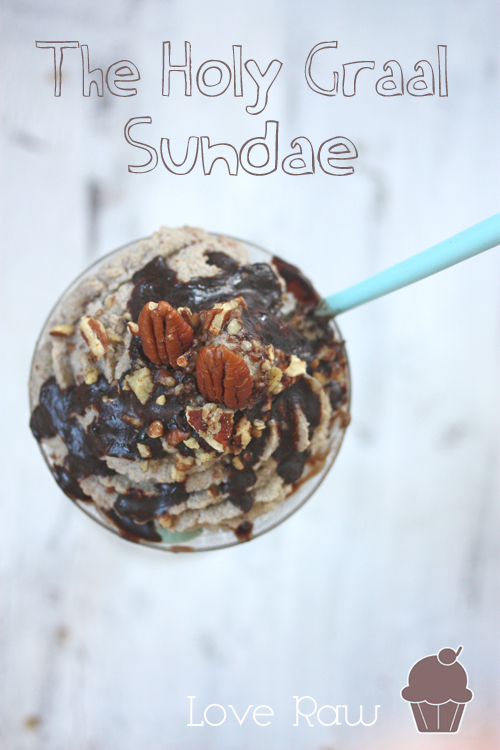 But it's a super healthy one, and you'll def have time to whip this up in between your doings! You deserve it. 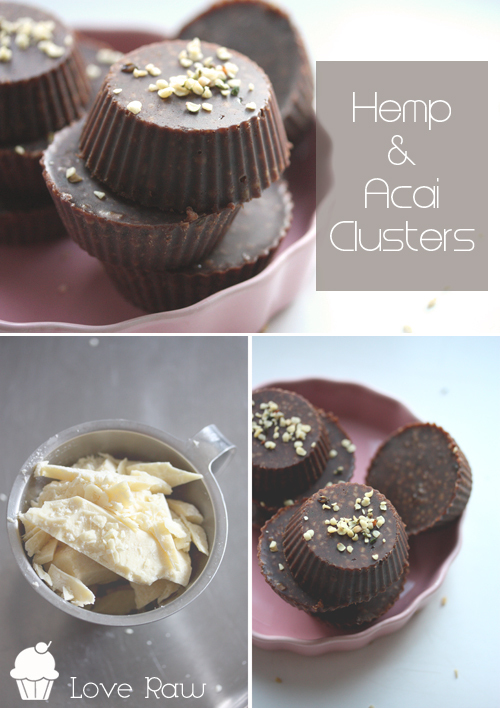 Hemp & Acaí Clusters, makes seven clusters. Slowly melt the cacao butter in a water bath. Add the reset of the ingredients to a bowl with the melted Cacao butter and stir until blended. Pour in silicone forms and transfer to the freezer until hard. Hampa & Acaí Chokladkluster, blir sju st.
Smält sakta Kakaosmöret i ett vattenbad eller i en torkugn. Tillsätt resten av ingredienserna i en skål med det smälta Kakaosmöret och rör om tills blandat. Häll i silikonformar och ställ i frysen tills hårda. • Want more? 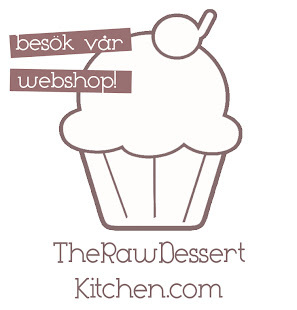 Then click like to The Raw Dessert Kitchen's Page on Facebook to get updates. I'd LOVE to hear from you! Tell me what you think about stuff, your opinion and feedback means a lot to me. Like this post? Then share it with the rest of the world! Hi friends, happy September! The inevitable end of summer and the graceful entrance of fall is upon us. 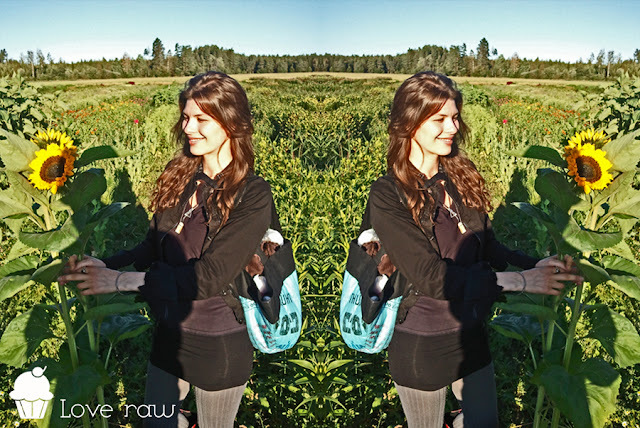 It is time to enjoy the produce of our beautiful Mother nature. Yesterday I felt a cold was breaking out. I rarely get colds but I felt my body was asking me for lemons, fresh ginger and raspberries. Why not putting them in a cake, I thought? I know these ingredients are great to boost the immune system (as you can read about further down). I also added some turmeric to the middle Lemon layer, both for coloring and healing properties. Fresh ginger: Ginger is a widely used herb in both traditional medicine and as a spice in many cultures throughout the world. Ginger is often referred to as a root, but it is actually an underground stem (called rhizome). In Chinese medicine, ginger root has traditionally been used to clean the body of viruses such as colds and flus. It also helps against the cold sickness. Ginger root is a versatile remedy for many more conditions: It is an aphrodisiac, helps the digestion and fatigue, is anti-inflammatory, helps for menstrual cramps and lower belly cramps (due to gas), nausea and believe it or not, as a pain killer both internally and externally. You can actually apply it to an area on your skin that aches to get relieve. Turmeric: Recent research has revealed that turmeric is a natural wonder, proving beneficial in the treatment of many different health conditions from cancer to Alzheimer's disease. As it is a natural antiseptic and antibacterial agent (great for colds and flus), is a natural liver detoxifier, is anti-inflammatory, slows the progress of cancer and may prevent metastases, may aid in fat metabolism and help in weight management, has long been used in Chinese medicine as a treatment for depression. Lemon: Lemon is an excellent fruit that aids in fighting problems related to throat infections, sore throat and tonsillitis as it has an antibacterial property. Lemon water assists in curing respiratory problems, along with breathing problems and revives a person suffering from asthma. Lemon helps to break fever by increasing perspiration. Besides this lemon acts as a blood purifier, is good for weight loss and it can help relieve many digestion problems (nausea, heartburn, bloating and parasites). Lemon is also a liver tonic as it helps the liver to produce more bile. It can help dissolve gallstones and kidney stones plus reduce the amount of phlegm. Raspberries: Raspberries can fight different allergies, including asthma and rhinitis. They are recommended to improve respiratory function and treat chronic coughs and colds. One cup of fresh raspberries contains about one-third of the daily recommended fibre value for adults, which can help speed elimination and possibly promote weight loss. Raspberries have significantly high levels of phenolic flavonoid phytochemicals such as anthocyanins, ellagic acid (tannin), quercetin, gallic acid, cyanidins, pelargonidins, catechins, kaempferol and salicylic acid. Scientific studies show that these antioxidant compounds in these berries have potential health benefits against cancer, aging, inflammation, and neuro-degenerative diseases. Please notice that the cups I use are 200 ml! 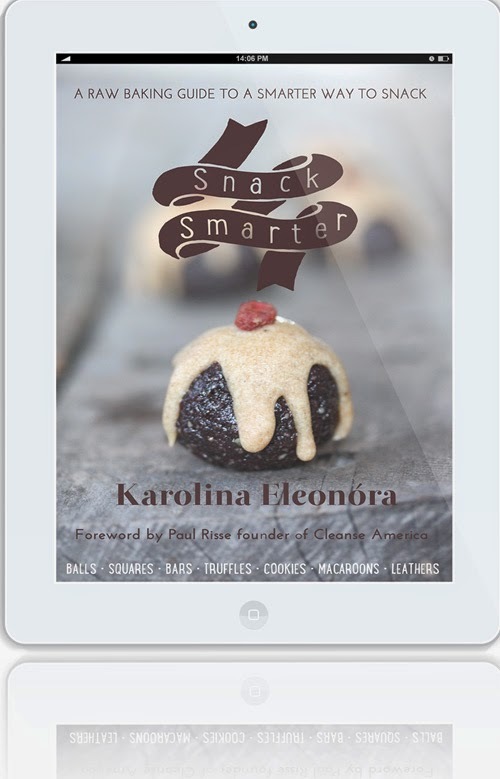 1) Start by slowly melting 50 gram of Cacao butter in a water bath or in a dehydrator own. While it's melting continue with the next step. 2) Pit the dates and soak them in water for about 5 to 10 minutes. 3) In your blender, grind the Pumpkin seeds into a flour and put in a bowl. Then do the same with the shredded Coconut and Hemp seeds. It doesn't have to be perfect, actually too fine flour can make the base a little heavy. 4) Now make a "date paste" of the dates by adding them to a food processor (strain the water first) and process together with the melted Cacao butter. 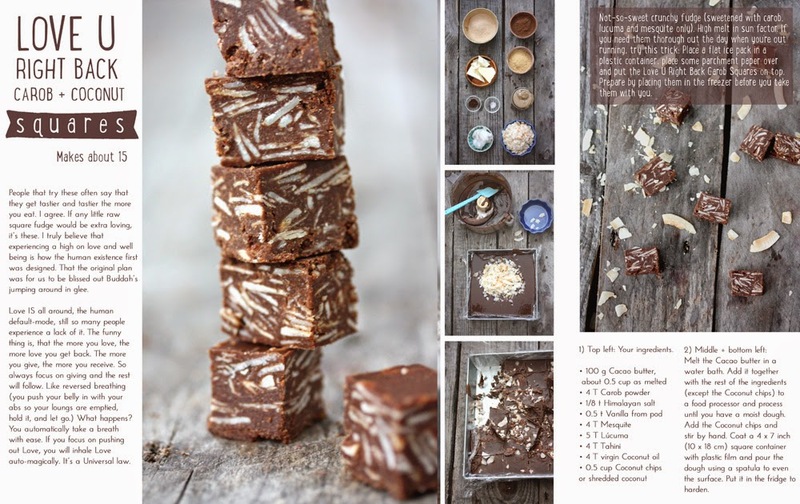 To the date paste, add the shredded Ginger, Himalayan salt, Vanilla, Lucuma and Water. Process until incorporated. 5) Add the nut flours to the paste and process on low speed until you have a dough. 6) Put the dough in a spring pan and continue with the Lemon layer! Use a wet spatula to get an even surface. 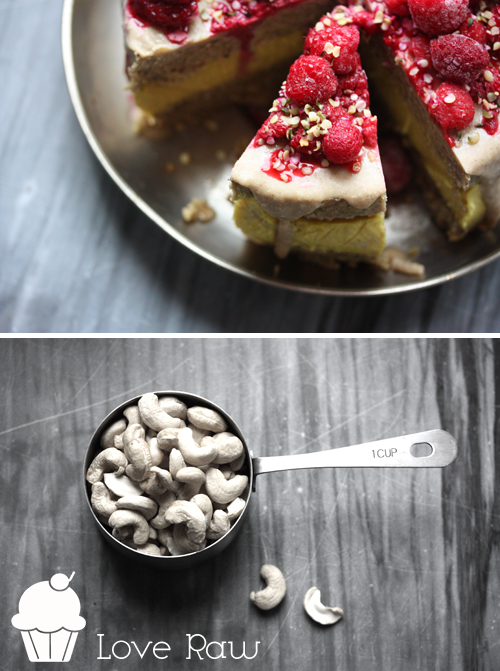 • 2 cups (400 ml) of Cashews (can be substituted with 1 cup Pumpkin seeds & 1 cup shredded Coconut if you want it nut free. To make this mixture smooth you have to use a high powered blender though). 1) Grind the Cashews into a fine flour using a blender. 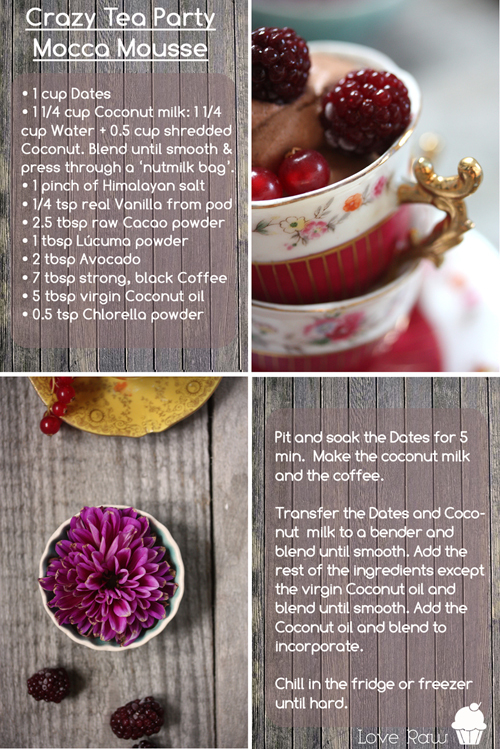 Add the rest of the ingredients to the blender except for the Coconut oil and blend until perfectly smooth. Add the Coconut oil and blend for 15 sec. 2) Pour the Lemon layer over the base and put in the freezer to harden for the top layer. If you want to you can finish the cake with only two layers + the frosting. Otherwise the third layer is going on top of the hardened Lemon layer, which is the same as the bottom layer. 1) Do the same dough as the bottom layer and apply to the harden Lemon layer. 1) Slowly melt the Cacao butter. Grind the shredded Coconut into a fine flour using a blender. Add the rest of the ingredients to the blender. 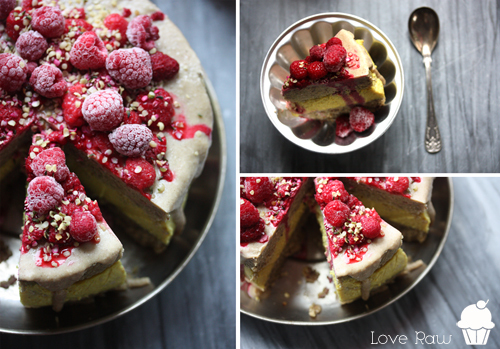 Pour the frosting over the cake and decorate with Raspberries and Hemp seeds! 1) Smält sakta Kakaosmöret i ett vattenbad eller torkugn. Medan det smälter, fortsätt med nästa steg. 2) Kärna ur Dadlarna och lägg dem i blöt 5 till 10 min. 3) Gör ett mjöl av Pumpakärnorna i din blender och häll mjölet i en skål. Gör mjöl av den rivna Cocosen och Hampafröna, häll i skålen. Det behöver inte vara ett jättefint mjöl, ett för fint mjöl kan göra kakan lite tung. 4) Gör nu en "dadelpasta". Börja med att hälla bort vattnet från dadlarna och tillsätt dem till en matberedare. Tillsätt det smälta Kakaosmöret och mixa till en pasta. Arbeta med en slickepott för att skrapa rent väggarn i matberedaren. Till pastan tillsätter du den rivna Ingefäran, saltet, Vaniljen, Lucuma och Vatten, mixa tills blandat. 5) Tillsätt nötmjölen till dadelpastan och mixa tills du har en deg. 6) Tryck ner degen jämt och fint i en pajform med löstagbar kant. Använd en blöt slickepott eller sked för att få ytan så jämn som möjligt. Fortsätt med Citron lagret! • 4 dl Cashewnötter (kan bytas ut mot 2 dl Pumpakärnor & 2 dl riven Cocos om du vill ha det nötfritt. För att få den här smeten riktigt fin behöver du en blender med stark motor). 1) Gör ett mjöl av Cashewnötterna i en blender. Tillsätt resten av ingredienserna utom Cocosoljan och mixa tills helt jämn och fin. Tillsätt nu Cocosoljan och mixa 15 sek. 2) Häll Citronlagret över basen och ställ i frysen för att hårdna eftersom toppenlagret ska bres på Citronlagret. 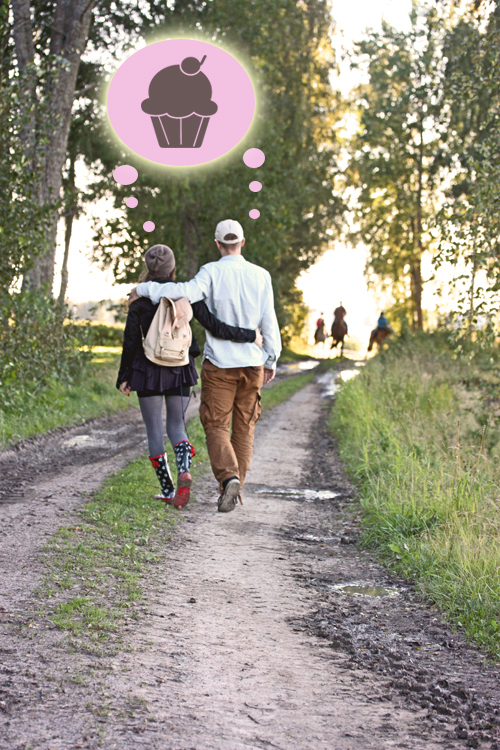 Om du vill kan du nöja dig med kakan nu och göra färdigt den med frosting och hallon. 1) Gör samma deg som botten lagret och bre på citron lagret när det är hårt nog. 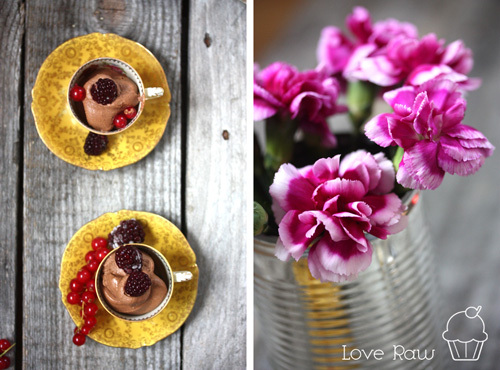 Are you a coffee lover? Good, cuz you're invited to a crazy raw tea party *on my bed* where the magic happens. Especially today as Im having a photo shoot on my bed (the room's got two windows and a mirror so the light is perfect). I love making mousses as you can pop what ever you fancy in them. Ah well almost anything. This time I flavored my mousse with coffee AND chlorella! Then I piped it out in small coffee cups to be enjoyed well chilled. 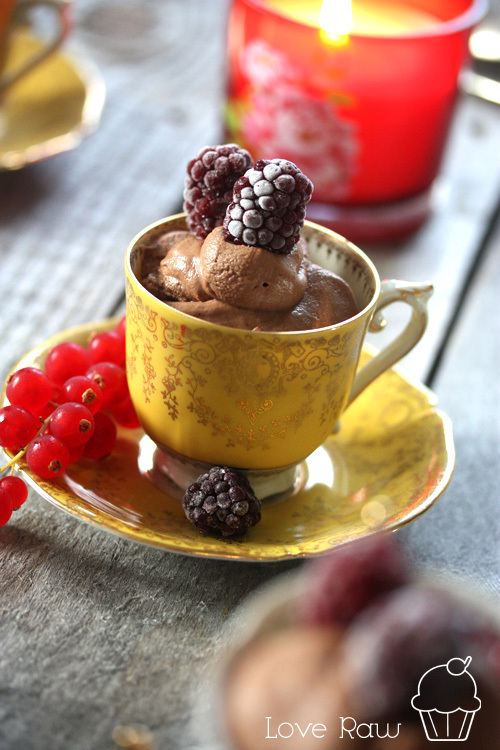 The mousse is quite heavy so you feel cute and sweet after only 4 to 5 spoons, which makes it the perfect after dinner dessert. This recipe serves about four small cups. I picture an old, odd lady living with 20 cats in a cabin somewhere where the mailman don't visit, that she feeds the bears and wolves around her house with leftovers and that she has a raven living on her porch. Anyhow, this lady would come up with a recipe like this one, trying to seduce any passtravelers. Only that the lady happens to be me. Minus the cats, raven, bears, wolves, the cabin and so but... yeah and Im not an old lady.. But the archetype of that old lady lives inside of me and I do try to seduce you with this mousse. Are you with me? Good. Let's dive into it! 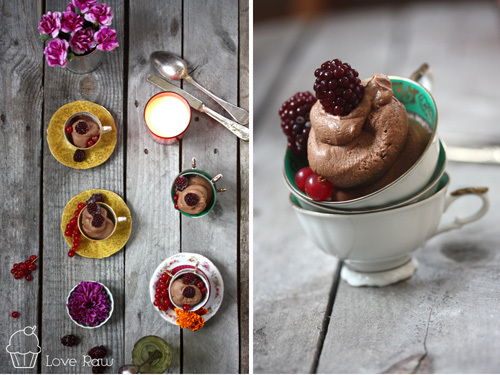 If you don't want 7 tablespoons of nasty, decadent, strong, black coffee in your mousse, then try adding some Maca instead. But hey, if you want to enjoy some coffee, do it stylishy sinful! Kärna ur och blötlägg Dadlarna. Gör Cocosmjölken och brygg kaffet. Överför Dadlar och Cocosmjölk till en blender och mixa tills slätt. Tillsätt nu resten av ingredienserna utom Cocosoljan och mixa tills helt slät. Tillsätt då Cocosoljan och mixa 15 sek. Lägg moussen i kylen över natten, eller för att den ska stelna snabbare, i frysen. Du kan hälla ner moussen i en plastpåse och när den har stelnat och blivit krämigare klipper du av ett litet hörn av påsen och klämmer i det i en skål / tekopp. Toppa med bär. 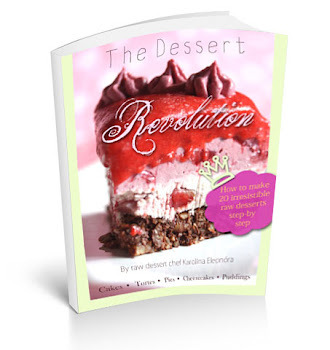 "Once up on a time, there was a Sundae so divine, that only the ones with the purest of heart could eat it. The legend tells of a small but growing number of people, being so in tuned with the divine, that they could fully and deeply dive into the molecules of joy found in this fountain of flavors. The feaster would be filled up with supernatural, divine powers and ecstatic love. These people are the only ones that have the magic touch to grab and set free the holy blue spoon that is stuck into the ice cream and that the sundae would then be lit in a glorious light. Many have looked for the Holy Graal Sundae and different theories swirls about, though the latest clue would be that it is somewhere in a small kitchen in the deep, dark forests of Sweden, guarded by a fair alchemist Lady named Karolinae, with her chevalier Sir Jakob The Brave Webmaster. And who knows, maybe the luck will come knocking on your door saying you are ready to grab the holy blue spoon and fill your mouth with spoonfuls of raw ice cream. Only the stars know." 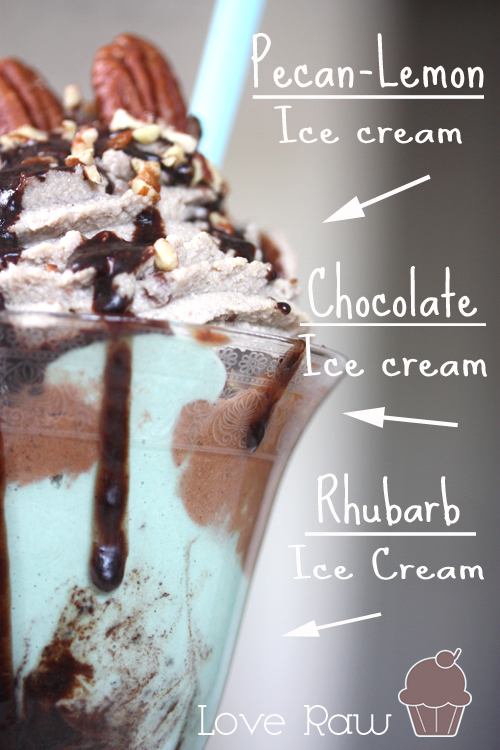 The Holy Sundae Graal, makes 2 graals. 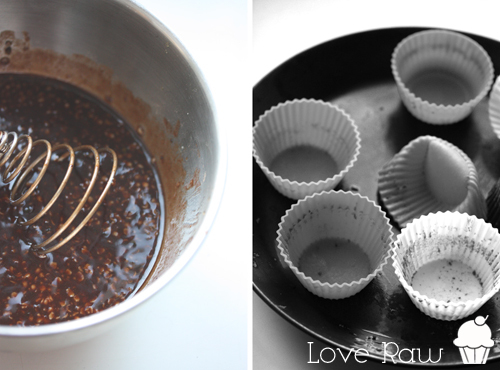 First make one basic batter that is divided into three batters (about one cup in each) which you then add flavor to. Peel about 2 rhubarb stems and cut them into cubes. Put them into the freezer until deep freezed then thaw them carefully under some hot running water. Any cold pieces of rhubarb will make the Rhubarb ice cream lumpy. The process of freezing rhubarb and thawing it like this makes rhubarb a really great ingredient in the raw dessert kitchen. You'll get a wonderful summer-flavor! And the ice creams doesn't have to be deep freezed, only slightly firmer. The important step is to let the Pecan-Lemon Ice cream get firmer so you can pipe it! Slowly melt the Cacao butter in a water bath or in a dehydrator. Grind the Cashews into a super fine flour in a blender. 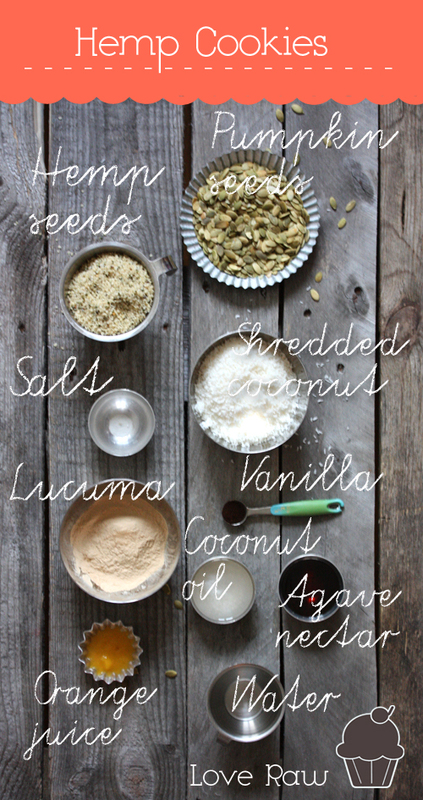 Add all the ingredients except for the Coconut oil and blend until completely smooth. Then add the Coconut oil and blend for maximum 15 sec. Divide the batter into two bowls, about 1 cup in each. 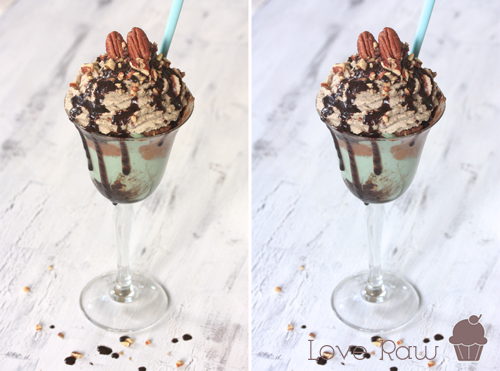 Continue with the Pecan-Lemon Ice cream. • Zest from 2.5 organic Lemons (about 0.5 teaspoon + 1/4 teaspoon of zest). Put into a food processor or coffee grinder to grind the Pecans into crumbs. Add the crumbs to the Lemon Ice cream and stir by hand. Pour into a low container and let it chill in the freezer for about 30-40 minutes. It needs to be hard enough to be put into a pastry bag. Otherwise you can just put the Pecan-Lemon ice cream on top with a spoon. Stir the ice cream every now and then. You will se how it gets creamier and creamier by the minute. Blend to incorporate. 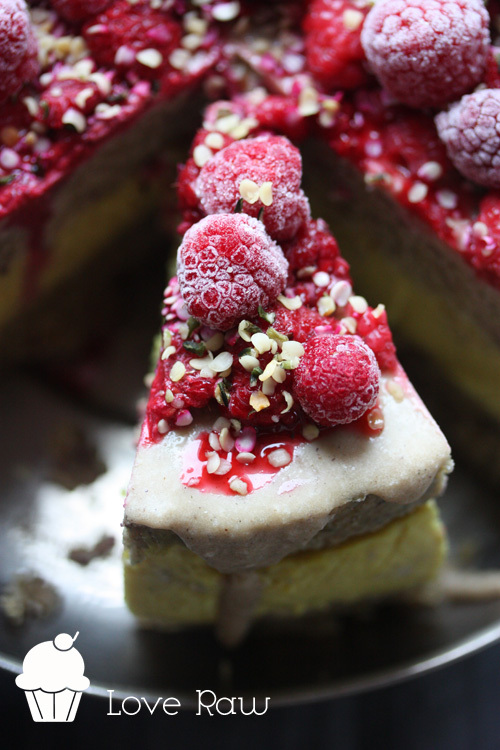 Don't put the Cacao ice cream into the freezer just yet. Now make the chocolate chip! Slowly melt the Cacao butter in a water bath. Transfer to a bowl and add the rest of the ingredients. Stir by hand. Put a thin layer of the melted chocolate into a container to be put into the freezer. Save 2 tablespoons of the melted chocolate for decoration on top of the sundae. When the melted chocolate is hard, take it out of the freezer and brake it into small pieces that you put into the Cacao Ice cream, stir and put it into the freezer. Continue with the last ice cream! Blend to incorporate. Transfer into a container and put into the freezer to harden a bit. Assemble: First pour some of the melted chocolate in the bottom of the glass to get a nice color effect. Then add the Rhubarb Ice cream, the Cacao Ice cream and finally pipe the Pecan-Lemon ice cream on top. Add the melted chocolate and sprinkle some pecan crumbs. Now dig in and enjoy! 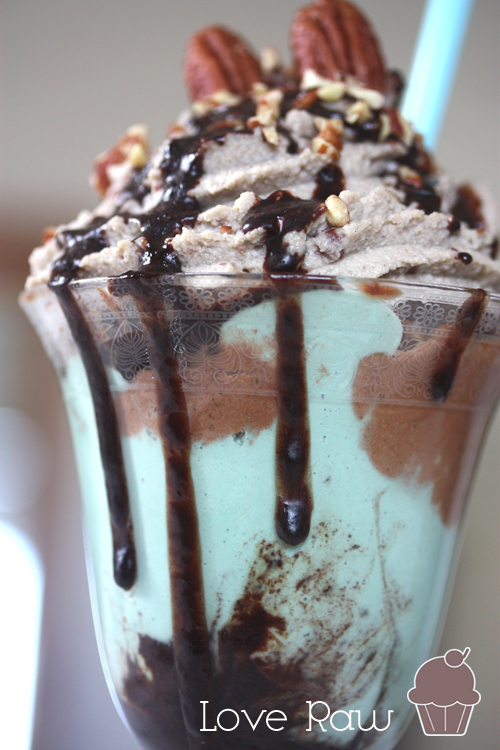 I don't know about you, but personally I adore everything with mint in it. 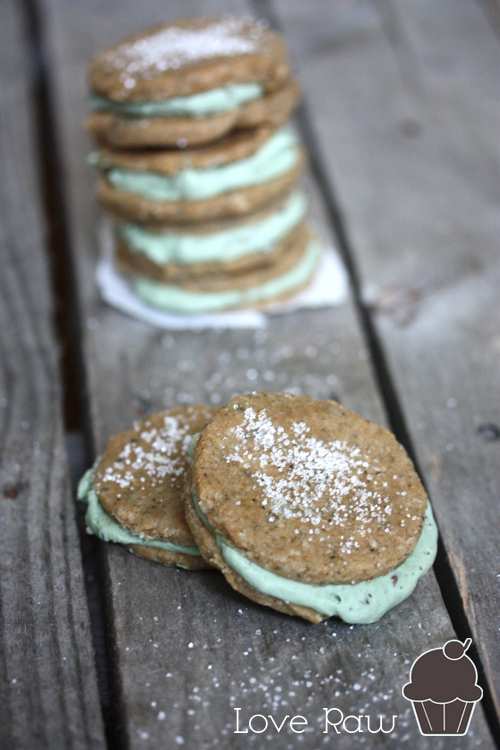 These Ice Cream Sandwiches have a Chocolate Chip Mint Filling that I originally created for one of the swirled pies in my eBook 'The Dessert Revolution'. The pie ('Mint Kiss Swirl Pie' on page 27-28) is swirled with a vanilla filling and this mint filling, loaded with gorgeous cacao nibs that gives that chocolate crunch. The Sandwich cookies does not require a dehydrator, though they need to be a bit freeze to harden. 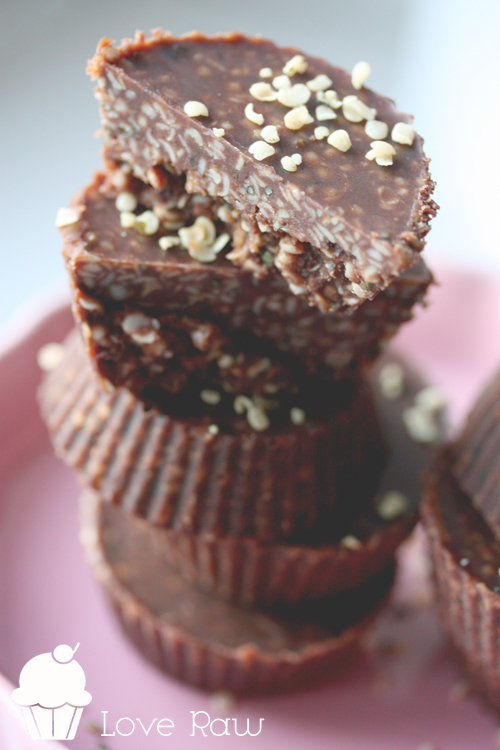 They are based on hemp seeds, pumpkin seeds and shredded coconut. If you like your seeds soaked and sprouted it is fine. Only make sure they are dry before you start making a flour of them. • Hemp can grow almost everywhere on this planet. By nature hemp is organic as it doesn't need any fertilizer, chemicals, and pesticide. It adds nutrients to the soil, removes toxins, aerates the soil and prevents soil erosion with it’s long roots. Hemp actually leaves the soil in better condition than before it was planted. 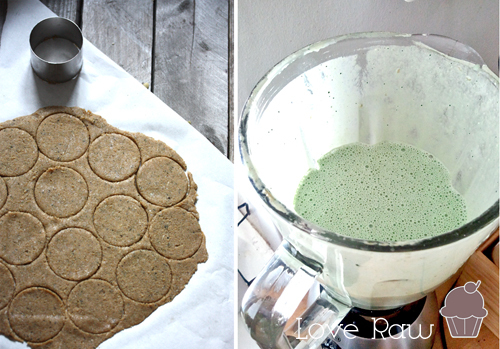 • You can make hemp milk out of hemp seeds. • The hemp plant can be used for three important and usable products as the seeds, the powder of the seeds (hemp protein powder) and the oil, all is highly nutritious. You can also eat the fresh leaves in a salad. • Hemp is very rich in nutrients such as omega fatty acids, amino acids, and minerals. The seed oil contains 80% essential fatty acids (EFAs), linoleic acid (LA, 50-70%), alpha-linolenic acid (ALA, 15–25%) and Gamma-Linolenic_acid (GLA, 1–6%). • Both the complete protein and the essential oils contained in hemp seeds are in ideal ratios for human nutrition. • 65% of its protein content in hemp is in the form of globulin edestin, so that it can actually be used by the body in its raw state. • Hemp seed oil promotes a beautiful skin and hair, nourishing both on a cellular level. 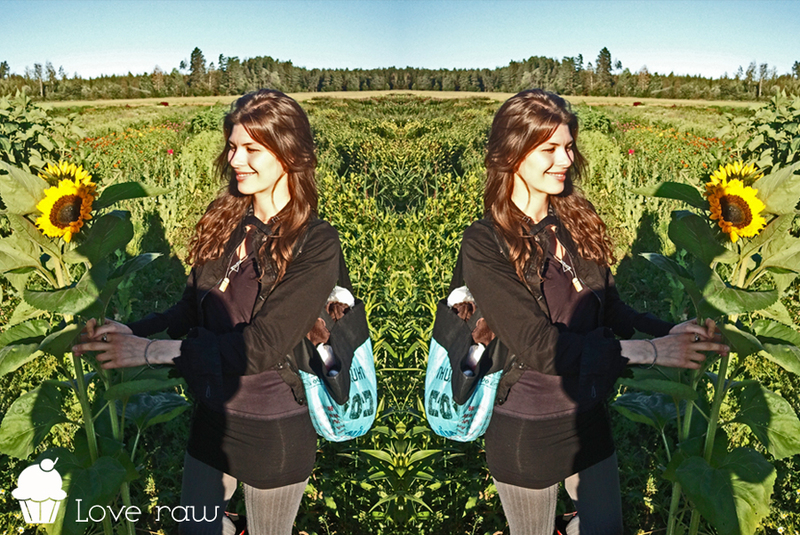 As a daily routine, apply hemp oil to your skin and it will be absorbed where the EFA's can go straight to work! Also the GLA acid is healing for the gut which also promotes a glowing, healthy skin. • The oil and the protein powder is perfect for athletes wanting defined muscles. • Add a handful of hemp seeds to your smoothie and you will get a creamier, more nutritious and more satisfying smoothie. I find that a couple of teaspoons of orange juice pares very well with hemp. Makes about 8 double cookies. Grind the Hemp seeds, shredded Coconut and Pumpkin seeds into a fine flour using a blender. Transfer to a large bowl. Add the rest of the ingredients and stir by hand until you get a dough. Put the dough on a piece of greaseproof paper and flatten it out. 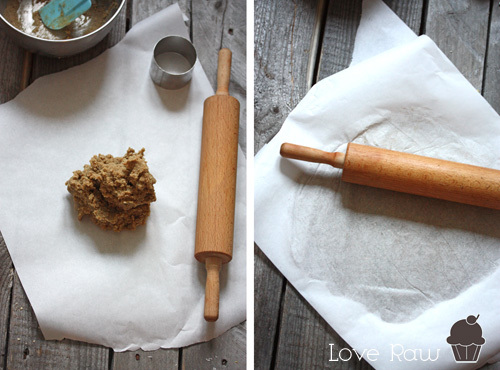 Put another piece of greaseproof paper on top and work the doug out with a rolling pin. 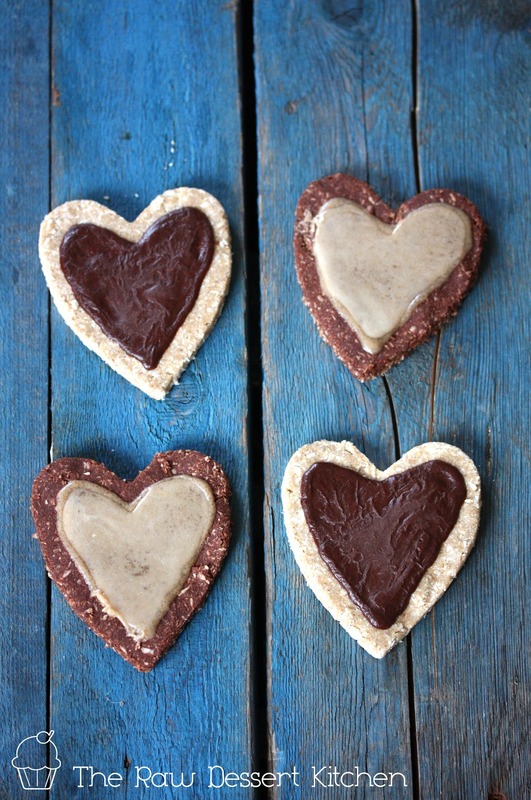 Stamp cookies with a cookie cutter and lift the whole paper up, with the dough and place it in the freezer. When the cookies are hard you can carefully peel them off the paper. Slowly melt the Cacao butter in a water bath or in a dehydrator. Grind the Cashews into a super fine flour in a blender. Add all the ingredients except for the Coconut oil and Nibs and blend until completely fine. Then add the Coconut oil and blend for maximum 15 sec. Finally add the Nibs but don't blend. Make sure to adjust the flavors to your liking. 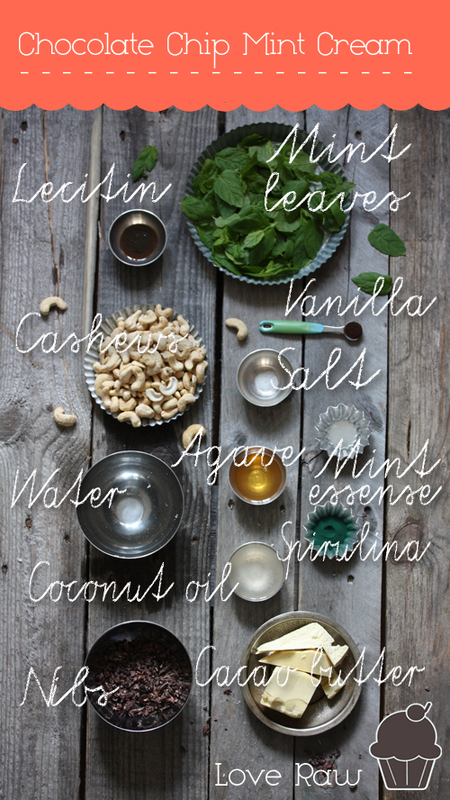 Add a little extra sweetener or mint essence if you like. The filling will taste the best when well chilled. Pour the batter into a container with lid that can be stored in your freezer. The batter will at this point look rather loose, but don't worry, it will turn into the creamiest filling after some time in the freezer. 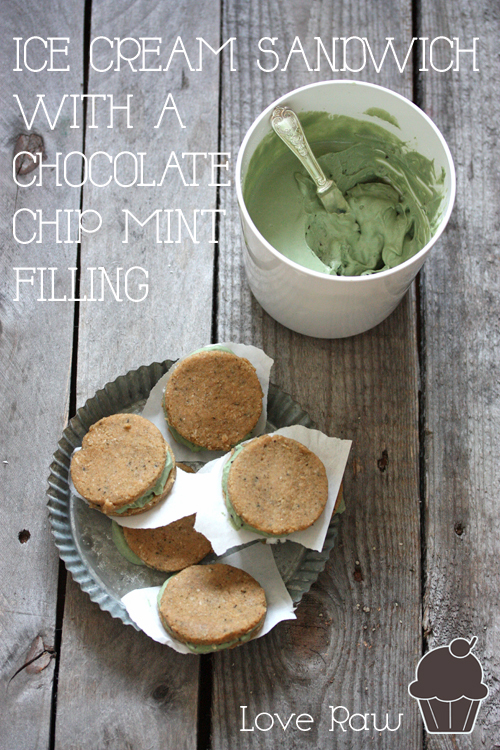 You need to freeze the mint filling for about 1.5 hour. Stir it every now and then for an even result. When it is creamy and hard enough to be spread on the cookies it is done. Gör ett mjöl av Hampan, Cocosen och Pumpakärnorna i en blender. Tillsätt resten av ingredienserna till en stor skål och rör för hand tills du har fått en deg. Platta ut degen ovanpå ett smörpapper. Lägg sen smörpapper ovanpå degen och kavla ut med kavel ca 0.5 cm tjockt. Tycker du det blir för kladdigt kan du mala lite mer mjöl och strö över. Stansa kakaor och lyft över hela smörpappret med degen på till frysen där de får ligga och hårdna. Ta sen en osthyvel el. liknande och lossa försiktigt på kakorna. Lägg dem åter i frysen. Fortsätt med mintkrämen! Detta recept blir nästan en hel normalstor blender-kanna full och det kommer bli smet över efter att du brett på den på kakorna. Antingen kan du använda resten av smeten som glass, eller göra halva receptet nedan. Vill du ha många Sandwich cookies kan du göra dubbla satsen cookies och hela satsen smet nedan. Mal Cashewnötterna till ett fint, fint mjöl i en blender. Tillsätt resten av ingredienserna förutom Cocosoljan och Nibsen. Mixa länge och väl tills du har en perfekt smet. Den kommer att se lös ut, men allt ordnar till sig sen i frysen och blir till den krämigaste glassen du kan tänka dig. Tillsätt den smälta Cocosoljan och mixa max 15 sek. Slutligen häller du i Nibsen utan att mixa och häller upp på burk som ställs i frysen. Var noga med att smaka av. Justera mängden sötma och mint tills det smakar perfekt för Dig! Smeten kommer smakmässigt mer till sin rätt som fryst. Låt frysa i ca 1.5 timme. Rör om då och då för att få en jämn frysning. När smeten börjar få en krämig konsistens av det tjockare slaget kan du skeda på eller spritsa på fyllningen mellan kakorna. Tips: Spirulinan färgar smeten knallgrön, så vill du ha en ljus mintgrön färg som på bilderna använder du 0.5 tsk Spirulina. Vill du ha en mörkare färg tillsätter du mer. Jag använder Spirulina till "mint färgning" eftersom det är en blågrön alg. Skulle du försöka färga med tex nått annat grönt pulver som hampaprotein, korngräs eller dyl, blir det ett gulaktigt resultat och det kommer inte se ut som mint. -----------> Why is hemp YOUR favorite super food?